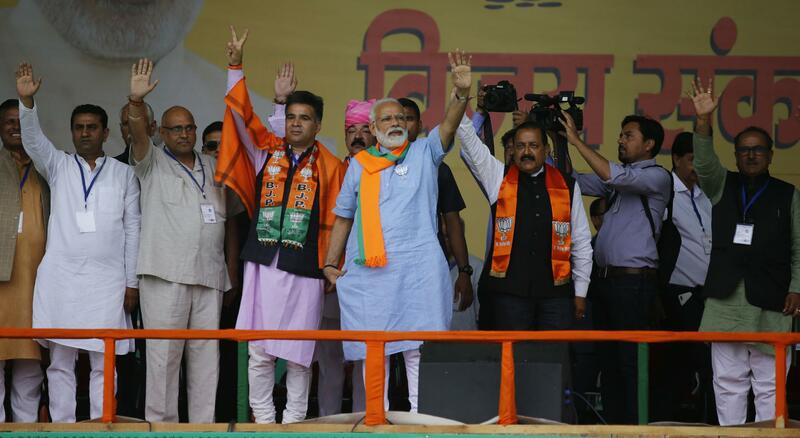 JAMMU: Prime Minister Narendra Modi in his third rally at Jammu in the last 3 months again started his address in Dogri saying that “Jammu is a land of warriors”. He also talked of Maa Bawe Wali, Maa Vaishno and Maa Sukrala saying that he pays obeisance to these goddesses. “Jammu is a land of warriors and I pay my obeisance to Maa Bawe Wali, Maa Vaishno and Maa Sukrala,” Modi said while starting his address to the jam packed venue at Kathua. “I am pleased to be here at Jammu, the land of great warriors,” he said amid deafening sloganeering of ‘Modi-Modi, Main Bhi Chowkidar-Main Bhi Chowkidar and Phir Ek Bar Mod Sarkar”. The venue was jam packed beyond capacity and thousands of people had to return as they were not allowed to enter the venue after 10:30 AM. The Prime Minister had to arrive at the rally venue at 11 AM. Such was the enthusiasm among the people that Modi had to stop his speech repeatedly as people were repeatedly chanting slogans “Modi-Modi, Main Bhi Chowkidar-Main Bhi Chowkidar and Phir Ek Bar Modi Sarkar”. The Modi Mania was at its peak that people in large numbers kept waving at the chopper carrying Modi till it went out of sight.